EXCUSE me but your scooter has three wheels! Why yes it does, thank you for noticing. 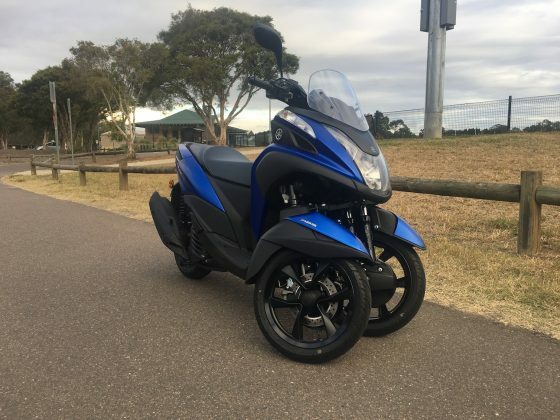 The 2018 Yamaha TriCity 155 does indeed have three wheels. Two at the front and the larger drive wheel at the rear. The TriCity is also a true step-through scooter that will certainly be a discussion starter, as well as no doubt causing some debate about the double front wheels this scooter has. For the record, this scooter (or is it a trike? It has three wheels after all) looks pretty good. The finish, in Yamaha’s Cyber Blue, looks great. It’s also available in Oxford Grey, which looks good too. The front has a sporty, aggressive style and the dual front wheel set up is similar to the Niken 900 that was launched in Austria in June 2018. 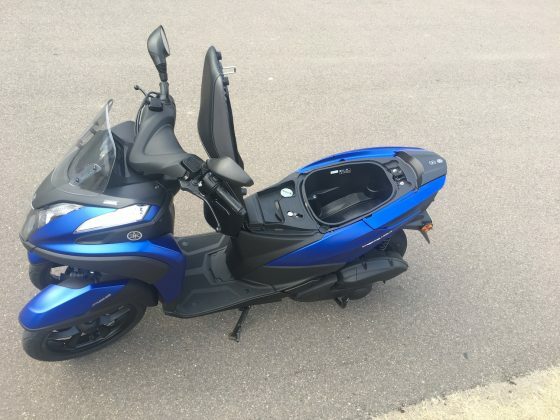 The scooter is powered by Yamaha’s Core Blue engine. A single cylinder power plant that is smooth and eager. Up to 60km/h, the bike holds its own, making it a perfect city commuter mode of transport. 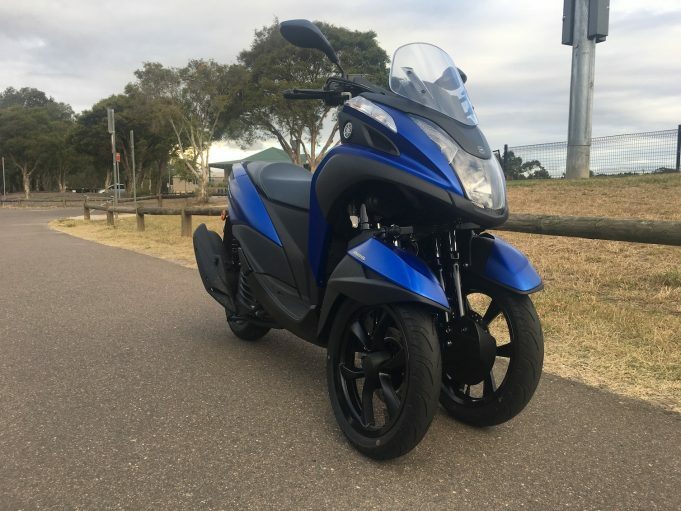 It’s quick off the mark and can easily keep up with traffic, and the very frugal 14.8BHP and small 7.2-litre fuel tank means the scooter has exceptional fuel economy as well. The fantastic “twist and go” engine and gearbox combination makes traffic and city streets a breeze, and the gearbox is the same V-Belt automatic that is used across the scooter range. The TriCity rides very well, with smooth and even power delivery. On Sydney streets, which can range from potholed and rough to smooth as silk, it handles all the different surfaces with ease. If this is your first bike, and you’re not confident, then the double front wheels add a level of stability that is often the tricky part of riding a conventional two wheeled scooter on some of our rougher streets. It’s a great place to start and continue if economy and good emission numbers are the deal breaker for you. Stopping is taken care of by Yamaha’s Unified Braking System and ABS is also standard. As good as it is in the city though, long trips on country roads may be its downfall. Highway speeds for long periods are not its strength, but this a small price to pay for this little fun machine. The handling is good, although not as crisp as you find on its two wheeled brethren, and yet it will still put a smile on your face on some twisty low speed roads or just riding to the shop to buy milk. There is pretty decent sized storage under the seat, with a light and all, that will hold a helmet with ease, and it has an on-board phone charging port in the glove box (on the right side under the throttle). The fuel cap is also hidden under the seat and there is even a hook in front of the rider that will hold your shopping bags for the milk and bread that you picked up on the way home. As a true step through scooter there is plenty of room for the shopping and the digital dash is pretty easy to read. All in all it’s a nicely put together piece of machinery that will give its rider confidence, and living with it will be a breeze. It’s on the street at $5,099 (plus on-roads) and has a wet weight of just 165kg. 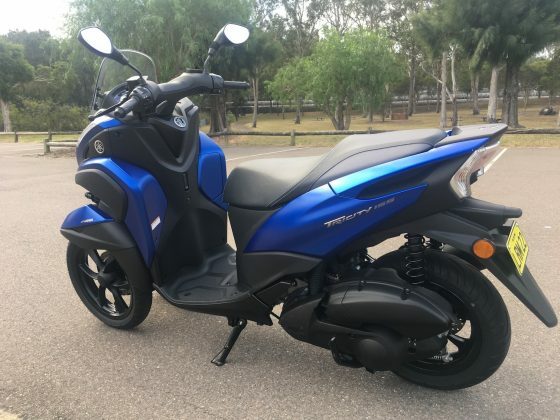 Our test bike was provided by Yamaha Motor Australia. To find out more about the 2018 Yamaha TriCity 155, contact your local Yamaha dealer. Pros - comfort; small but powerful engine; charger in glove compartment. 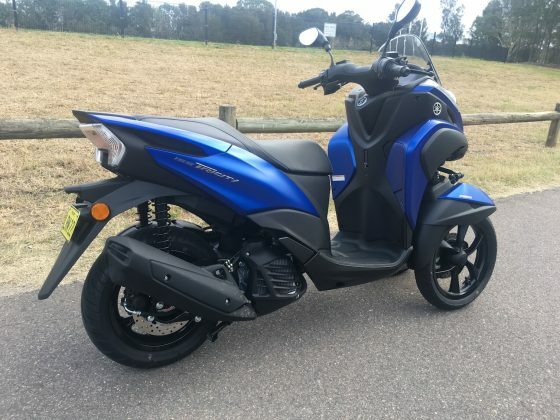 Cons - poor top end power; handling not as sharp as a two wheeled scooter.